A well-organized space is essential to productivity! My sewing corner is over by the windows. 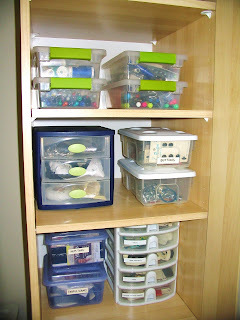 All of my sewing supplies (and even some of my painting supplies) are close at hand in nifty storage cubes. My desk is actually a dining table I got at Ikea when I used to live in a tiny studio apartment. To the right of my desk (unpictured) is my ironing board so I don't have to move very far from my sewing machine to press seams. 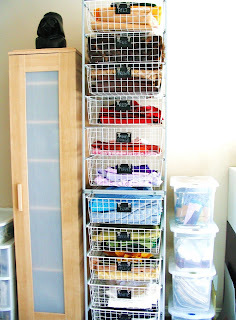 I discovered this fabric storage idea online at hgtv.com. 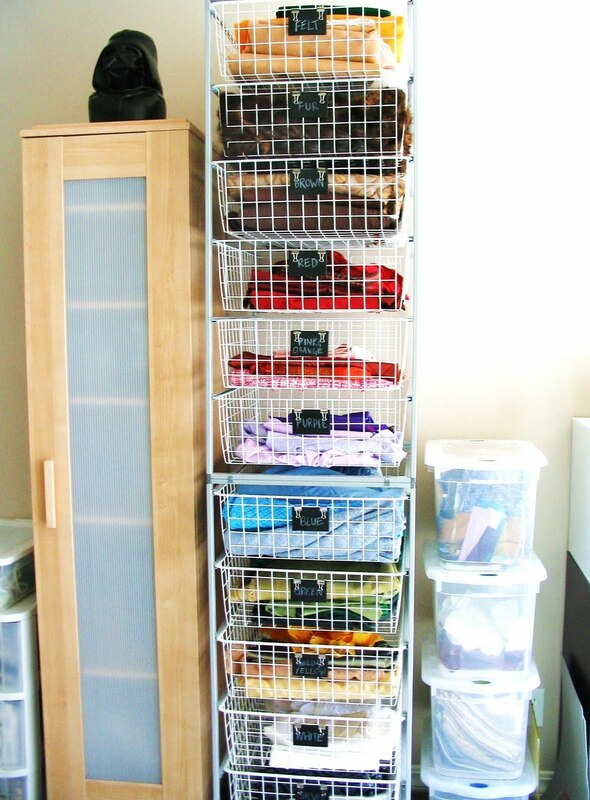 IKEA sells these great wire baskets and frames for very affordable prices. I purchased two sets for a total of 12 baskets stacked floor-to-ceiling. 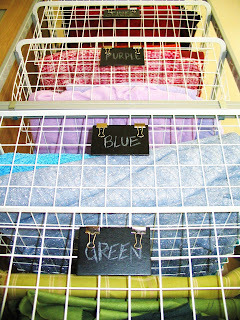 The wire baskets allow my fabrics to breath while also allowing me to easily see all of the different fabrics I have available to me. I sorted the fabrics by color and hung little labels on the on baskets! The labels are small pieces of wood I purchased at Michael's and spray-painted with chalkboard paint. Then I used white chalk to write on the color names. I hung them with mini binder clips. If I ever need to get more in the future it will be easy enough to pick up more of these stackable, modular baskets! Over the years I have ended up with so many little small organizers that it made sense to repurpose a tall wardrobe as a shelving unit to house them all. Now, whenever I need buttons, snaps, hook-and-eyes, Velcro or other odds and ends I know to look behind door number one! I dedicated a separate little center for my paper crafts and ribbons. I usually separate my paper crafts from my sewing so it makes sense to keep all of the scrapbooking/paper supplies and tools separate too. 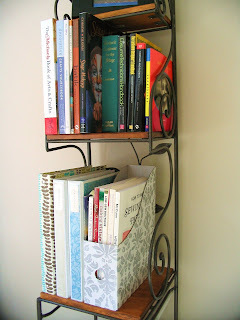 I transformed a wine rack into a bookshelf! 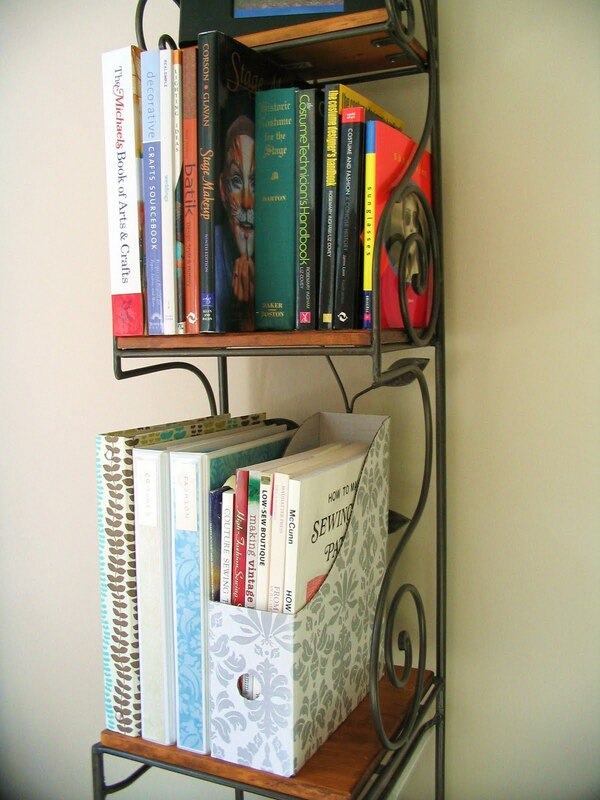 It holds my books related to crafts, sewing, fashion, costume design, stage makeup, etc. 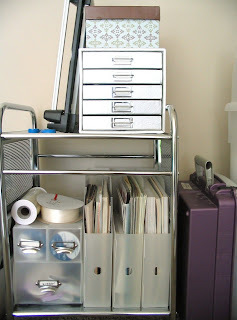 On the lower shelf are my "idea binders", which are full of doodles and notes... creative inspiration,sketches, small patterns and diagrams for quilts. Two of the idea binders are plain white ones, the kind that you can slip paper into the front of. I customized them with pretty scrapbooking paper to make the binders a little more attractive. i wish someone would come organize my office! looks like a productive space! I think the biggest tip I can give is to leave yourself empty space to work! 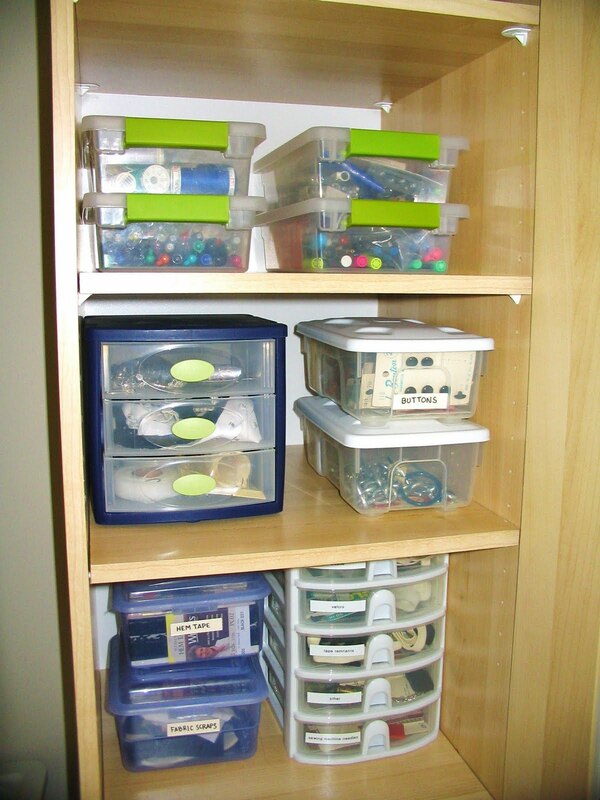 Go vertical with the storage and group your storage by related items. 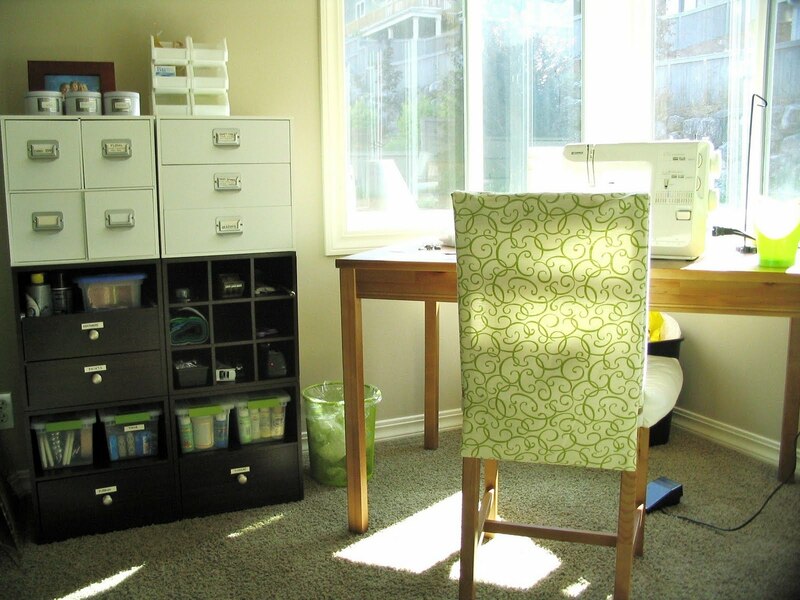 For example, one corner of my craft room is Wrapping Central and Paper Crafts. The opposite corner is for fabric, notions, sewing projects. In the middle is my sewing machine, ironing board, and small storage for tools, paints and other things I need to have in arm's reach for any project. The wire baskets are from IKEA.